There are numerous mentions of weeping statues or weeping paintings representing Virgin Mary, Christ or some other famous saint but from what I have read, most of them are proved to be hoaxes by the church. The statues or paintings in question were weeping blood, myrrh, salty water or oil and the investigations of the church proved that the blood belonged to some nun or monk from the same establishment and the other substances contained organic particles specific to present days. 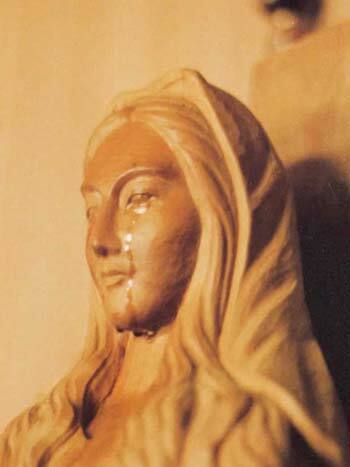 The interesting part is that the Vatican has actually approved some of these weeping statues, and one of the most famous is Our Lady of Akita, a notorious phenomenon also associated with some apparitions of Virgin Mary. 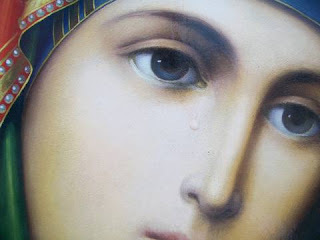 Another example of a very intense and passionate debate is the statue of Virgin Mary from Fatima, or the weeping holy icon of the Panagia from the Monastery of Elyakon, and the examples could go on. Some of these representations are incredibly beautiful and have a very powerful message, it seems to me they don't even need tears to touch your heart.